According to studies, meetings take up 15% of an organisation’s collective time. Not surprising as meetings are essential for organisations to share information, debate issues, present reports and arrive at decisions. The bug bear is that executives consider more than two thirds of them to be unproductive failures . There could be a number of reasons for this – disinterested participants, lack of a proper agenda or follow-up, the environment and even technology that disables rather than enable meetings. AV technology is an integral part of meetings. There is no hiding from it. It is therefore imperative that AV technology enhances and complements the experience of all those involved in meetings. A positive experience will certainly go a long way in making meetings productive and effective and AV technology can play a key role in that experience. The challenge for every meeting is how to present convincing messages and manage feedback wherever the venue, from a one-to-one interaction in an intimate meeting space to a one-to-many situation in a boardroom or auditorium. It can be difficult to set up and run meetings in today’s business environment, when many of the necessary attendees work remotely or are on the road. It may be challenging for remote participants to feel engaged and contribute enthusiastically, should they be battling the typical voice quality and latency problems of a telephone conference call. Meeting organisers are discovering that Epson’s corporate display solutions are the key to great presentations, from start to finish. Their projectors tick all the boxes - quick and easy set-up, simple control, tremendous versatility, incredible colour quality and brightness, and interactivity via unified communications. With an Epson projector, meetings become truly collaborative as all participants are fully involved, unleashing their creativity and driving productivity. 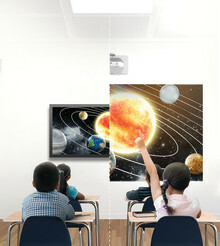 Epson’s projectors are amazingly easy to transport and set up. They are significantly lighter and less prone to in-transit damage than flat screen displays, making them simpler and far more cost-effective to install, in terms of cost-per-inch comparatively. This is significant – a study by Shoretel revealed that almost one in five Singapore professionals waste between 6 and 10 minutes setting up each meeting, because of lack of clarity over conference technology or issues with bandwidth and the Internet . The typical compatibility problems and delays found with flat screens are not an issue for Epson’s projectors. It’s quick and easy to connect devices, share content and involve everyone both at the meeting and remotely over the network with full support for Bring Your Own Device (BYOD) and Unified Communications (UC) strategies. panel display, you have one screen size– and that’s it. Epson’s projectors give you a choice of scalable screen sizes suitable for various meeting spaces, boardrooms and even larger venues such as auditoriums. What this means for meeting participants is the optimal screen size to replicate the comfortable, familiar desktop or laptop experience for everyone in the meeting, including those furthest away from the screen. This scalability and functionality – not available with a flat screen - mean it’s easy to ensure that content shown is not too small, is of high quality and clearly visible to all. There’s no restriction on viewing angles, no blind spots and no glare on the screen, thus opening up the presentation to the widest audience. That way, everyone in the meeting has the same opportunities to share and engage. Whatever the image size, Epson’s projectors deliver amazing quality images up to Full HD WUXGA resolution - even in large, brightly-lit environments. With rich, lifelike colours, superb detail and significantly less pixelation than found on flat panels, meeting participants will avoid eye-strain while enjoying vivid, engaging images and the sharpest text. Audience involvement is enhanced when subjects are brought to life with Epson’s 3LCD technology that combines high resolution and brightness up to 25,000 lumens. A feature of Epson’s projectors that will delight the finance department as much as the meeting organiser, is their ability to replace flip charts and whiteboards. For a fraction of the cost of an 80” flat panel display, users can create an all-in-one presenting solution. The flat panel solution simply can’t replicate this versatility. Sharing knowledge is the key element of business development in today’s corporate world, and interactive whiteboard conversations have been shown to lead to 50% higher lead conversations, 29% shorter time to productivity and 15% shorter average sales cycles . Epson’s collaboration solutions provide participation from up to 50 PCs and the display of up to four devices simultaneously. 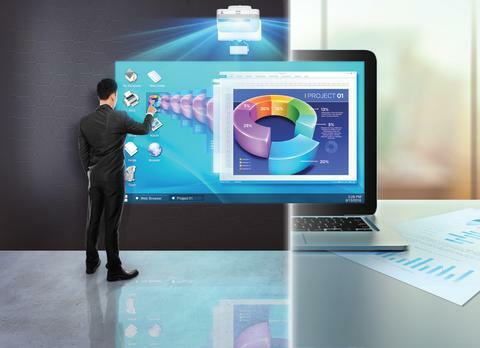 BYOD strategies are becoming an essential feature of business operations, and the way the Epson projector solution allows employees to quickly and easily connect their own devices and share content with colleagues enables greater flexibility and encourages more effective working. Whiteboard content can be viewed and annotated directly from up to 15 laptops or tablets via a web browser and then saved, sent or printed. You do not need to be a technical expert to manage presentations with an Epson projector. Projector features and controls are all accessed from the single comprehensive home screen, which is an easy access dashboard that displays the most frequently used functions, keeping the presentation flowing smoothly. What’s more, some of Epson’s projector solutions feature Gesture Presenter that helps presenters move through the slides using hand movements, adding ease of use and smooth transitions in the presentations. Unlike flat screens, Epson’s intuitive, - all-in-one meeting space solutions embrace unified communications and BYOD strategies, and remove the need for separate whiteboards and flipcharts. They facilitate effective information sharing and display from just about any device, and deliver the enhanced interactivity that turns meetings into truly productive conversations.